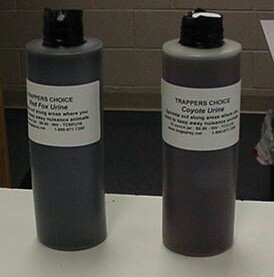 WHERE TO USE IT: Both fox and coyote urine have a multitude of applications. Trappers have been using it as a mask, a cover scent and a lure. They use it on their clothes, their boots and their hands as well. Though many go overboard with its use, urine has many practical applications. One of the best ways to use it is to trick the target animal into thinking another is in it's territory. Urine is applied to trees, traps, the ground or other areas where coyote or fox are active. Once detected, the animals will scent over what you have applied to reclaim their territory. A good set will trap many animals when used this way.